For a school project, I began to develop a Twitter dashboard to track hashtags and decided to continue afterward. 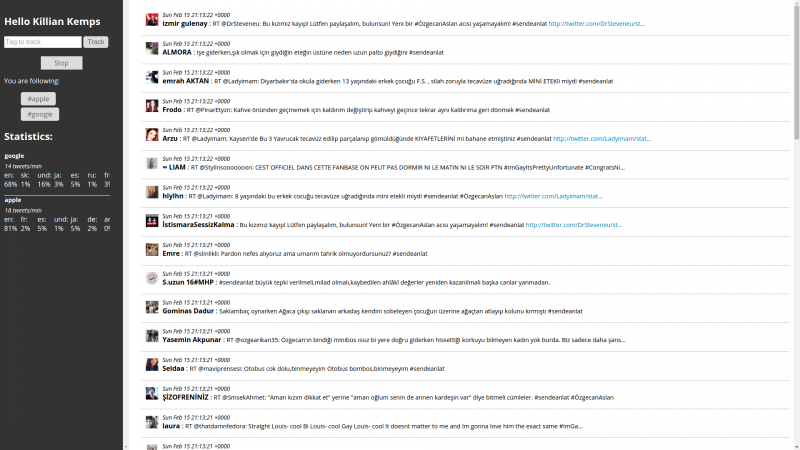 Now I'm developing my own Twitter web-client because I was not satisfied with those already available. As a Linux user there are some applications that can be used such as Turpial, Birdie or Polly. Those are either complicated to install, lacking in important features or with bad UX. Another possibility is using web applications such as Hootsuite, and I quite like to use it. However, as it is a service hosted by a company they can decide to make updates and force the user to change even if the service was satisfying until now. So I'm developing an app that is open source and that everybody can host himself. I ask you now to welcome KoalasLiveTweet! The name is a bit absurd, but it was the one I choose when we had to create our Github repository at school. I just finished the v0.2 with a means to to log in with your Twitter account and search hashtags to get their statistics and display the tweets. It is actually basic but I already have a few things to implement for the next version. You can download the app on this Githubrepository and as it is open source, you're welcome to report issues. For the moment I left the old installation instructions but I will work on the installation process so it takes less time to install it, making it easier to use. I will write an article, especially to explain how I will make the installation simpler. For the next version I would like to develop the multi-columns layout and the ability to see timeline and lists. A that time, this version would be close to my perfect Twitter client. What do you think about this initiative? Give me feedback so I can implement new features you'd like to see in the next version ! You found an error in this article? Some advice? You can send a comment by email to "blog at killiankemps.fr" with "[Comment][en][An open source Twitter dashboard that eats eucalyptus]" as subject.